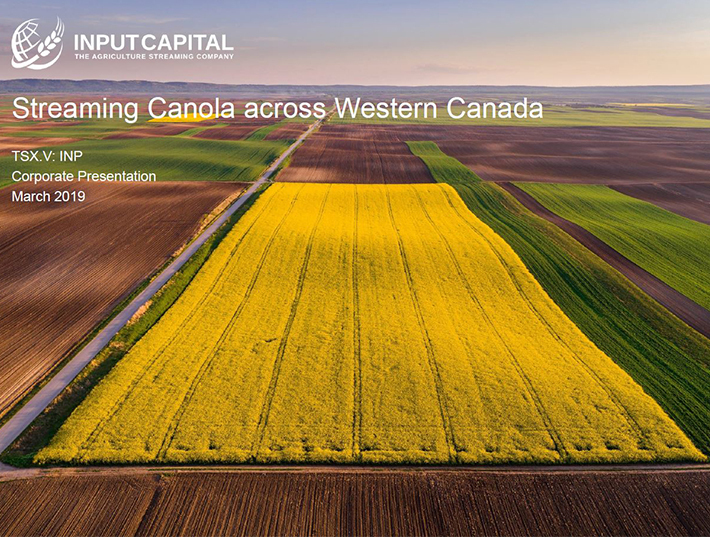 REGINA, Aug. 15, 2018 /CNW/ - Input Capital Corp. ("Input" or the "Company") (TSX Venture: INP) (US: INPCF) has released its third quarter results for the 2018 fiscal year. All figures are presented in Canadian dollars. "Mortgage streams continued to be the area of greatest activity for us this quarter," said President & CEO Doug Emsley. "With the success of farmers over the last several years, we are at a point in the cycle where farmers' incremental working capital needs are minimal, but mortgage financing is an ongoing need, at the time of mortgage renewals, farm refinancing, and expansion via acquisition. "Deployment into mortgages to the end of Q3 was $27.1 million – we are pleased with the response to mortgage streams to date and look forward to engaging with farmers about new mortgage opportunities when this year's harvest comes to an end. "Harvest activity is well underway across western Canada. This is always an exciting time of year for farmers and for Input – the vast majority of our revenue is recorded over the next several months." On April 12, 2018, the Company signed two term sheets for term debt to facilitate the expansion of its mortgage stream program. These facilities will allow Input to margin mortgage streams and will be secured by the underlying conventional farmland first lien mortgages. On July 25, 2018, the Company announced the completion of its first credit agreement for mortgage stream financing with Concentra Bank, the wholesale bank and trust company for Canada's credit unions. In early August, the Company completed a first draw against this facility. From the start of the NCIB in December 2017 to the end of the third quarter, the Company bought back 730,200 shares at an average price of $1.49. These shares were subsequently cancelled. For the quarter ended June 30, 2018, Input generated adjusted sales from streaming contracts of $1.536 million on adjusted streaming volume of 3,092 MT for an average price of $496.73 per MT. The sales from streaming tonnes plus net settlements from streaming tonnes for the quarter represent a 21% increase in quarterly volume over the comparable quarter one year ago, when the Company sold 2,536 MT of canola equivalent for revenue of $1.268 million for an average price of $500.07 per MT. For the three months ended June 30, 2018, Input recorded total upfront payments of $0.740 million into streaming contracts with 57 producers for the right to purchase over 46,000 MT of canola over the life of the streaming contracts. In addition, $16.079 million was deployed into mortgage streams with 24 producers. During the quarter, Input added 33 new producers to its streaming contract portfolio; 22 producers in Saskatchewan and 11 in Alberta. The remaining contracts were renewals, expansions and restructures of existing contracts. During the same quarter last year, total upfront payments made were $3.931 million and 124 new producers were added to the portfolio. Management believes that a good farming year in 2017 significantly moderated farmer demand for capital streams during the most recent period. From the start of the NCIB in December 2017 to the end of the third quarter, the Company bought back 730,200 shares at an average price of $1.49 prior to the end of the quarter. These shares were subsequently cancelled. The Board of Directors has declared a cash dividend of $0.01 per common share for the quarter ending June 30, 2018, representing $0.04 per share on an annualized basis. The dividend is payable on October 15, 2018 to shareholders of record on September 30, 2018. Last year was a good farming year for most farmers in western Canada. Yields and prices were strong, harvest went smoothly, crop quality was good, and grain movement was satisfactory in many areas. As a result, strong cash flow reduced the need of farmers to turn to the Company to solve working capital issues, which is the focus of the Company's capital stream product. Capital deployment into capital streams has been slow this year. Mortgage streams have been the area of most activity this year. The next year will provide us with a greater feel for the depth of potential demand for mortgage streams. Early signs are excellent – without any significant promotion, Input Capital has funded in excess of $27.1 million in mortgages since the mortgage stream became a part of the company's product suite. As of this writing, harvest activity has begun in most areas, a bit earlier than average. As a result, management expects significant early canola sales in late August and throughout September prior to the fiscal year end. These canola sales will enhance final results for this fiscal year.